After seeing all these Mcmansions crop up, I wonder if they’re going to become the apartment buildings of the future when the owners or the bank can’t find anybody to take them off their hands. there’s a reason why these are labeled SFRs. I’d hate to see these turn into multi-family units. SBG, what’s the most recent comp in this community? I’m surprised that so many are empty, too – no leftover $ for staging, I guess. That’s a good question. I’ve gone ahead and pulled up a property that is of similar size and age (i.e. brand new). 1416 S. 4TH AVE. sold for $2,480,000 back in September of 2007. 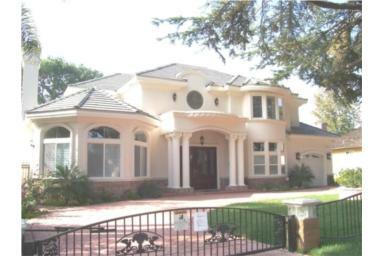 It is a new 8,040SF home sitting on a 25,571SF lot. Located just half a mile West of the 8th Ave. property, I would say it’s a good comp. Based on 4th Ave’s per-square-foot sale price of $308.46, our empty McMansion here is at least $500,000 overpriced ($385 psf). Since I don’t think the market has gotten any better since September, it is most likely more than that. I’ll leave it up to SBG to comment on the desirability of this comp’s neighborhood/location. Arcadian, thanks – that is really amazing, especially in terms of price psf. I have another question. In all seriousness, WTH are sellers thinking? Up there in Arcadia, over in the beach cities of LA, down in the beach towns of OC, in Rancho Santa Fe – etc. Basically, the top tier communities. Are they being led to believe by realtors that the glory days are coming back – or do they truly believe that some idiot is going to rush in and assume the bagholding position? I am astonished at the number of (what appear to be) reasonably intelligent people that think “it’s different here” (TM) (insert your local community). Along the lines of your prestigious location comment…yesterday we tried to get some feedback on a homeowner who was supposedly “thinking of selling” by his realtor. We were told that the homeowners think that their property is worth 6mm, and they’d take nothing less. Nevermind that it is NOT oceanfront, NOT remodeled, and NOT something you’d consider to have curb appeal. Oh, and that no property has EVER sold for that price in this immediate area. Let’s just say it’s about 3.5mm overpriced. I mean – have people just been smoking crack for the last year, 18 months? Do sellers believe that their homes are commanding premiums that have never been reached before – as our economy enters the toilet, we wait for cash influxes from the UAE, and banks are beginning to fail? The “comp” you listed is from Sept 2007. With all that’s happened in the last 5 months, I would say that the market price would be even lower than $308/sqft. The market price is whatever buyers are currently willing to pay for it regardless of what the owner thinks. I’m not sure if they were smoking crack, but they were definitely drinking the kool-aid and boy was that fountain flowing! Consumption of kool-aid was so severe and so widespread that people are apparently still overdosing from it. Like you, I too am astonished at the people who think things are going to get better soon and/or “it’s different here.” It’s natural for people to deny and block out negative parts of their lives. Unfortunately, it doesn’t make it go away and they’ll eventually be forced back to reality. They’re right in one thing though. It is different here (California). It’s particularly bad comparable to the rest of the nation.